Credit: Image credit: Benjamin Winkel and the HI4PI collaboration. The research looked at neutral atomic hydrogen–the most abundant element in space and the main component of stars and galaxies–across the whole sky in a survey known as HI4PI. "Radio 'noise' caused by mobile phones and broadcast stations pollute the faint emissions coming from stars and galaxies in the Universe," he said. "So sophisticated computer algorithms have to be developed to clean each individual data point of this unwanted human interference. "Next to the thousands of observing hours an even larger amount of time has been spent creating the final scientific data product released today." The HI4PI survey used CSIRO's Parkes Observatory and the Effelsberg 100m Radio Telescope operated by the Max-Planck Institute for Radio Astronomy. "These structures had been smeared out by the coarse sampling of the sky in the LAB survey," he said. "Pilot studies of the HI4PI data show a wealth of filamentary structures never seen before. "Tiny clouds become visible that appear to have fuelled star formation in the Milky Way for billions of years. "These objects are too dim and too small to be detected even in the other galaxies closest to us." "Like the clouds at the sky, all observations we receive from the distant Universe have to pass through hydrogen in our own Milky Way," he said. "The HI4PI data allows us to correct accurately for all these hydrogen clouds and clean the window we are watching through." 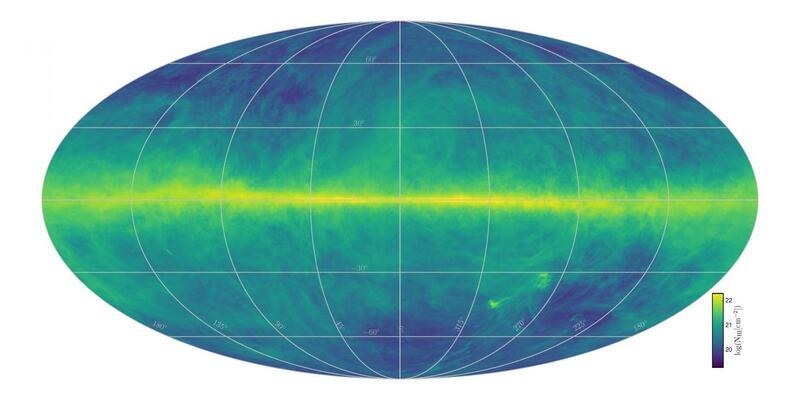 More Information: The name 'HI4PI' is drawn from the fact that this study measures radio wavelength radiation emitted from neutral atomic hydrogen atoms (HI) across the entire sky. Observing in all directions for an 'all-sky' survey in this way creates a sphere of data, and because the solid angle (a two-dimensional analogue of an angle) of a sphere is equal to 4π 'steradians' (or square radians), we chose the name HI4PI for this work. Multimedia: Images and video available from http://www.icrar.org/HI4PI (password: 'atomic'–removed when embargo lifts).